I think our addiction to petroleum makes us all part of the problem too. Before attending the National Commission on the BP Deepwater Horizon Oil Spill and Offshore Drilling hearing #2, Regulatory Oversight of Offshore Drilling this morning, I took part in a protest in front of the very same Ronald Reagan Building a few blocks from the White House. Shortly I was inside where the hearing was taking place. Photos of THAT event are at flickr. Also, I joined the TEDx oil spill conference in June. Some very surprising photos of a presentation at TEDx are here – still researching this for more data on the nasty orange blobs! The BP Blowout catastrophe must not fade from the spotlight. It may already be having effects on the oil industry. On the North Sea oil platforms it is unclear why but there’s a spike in reported leaks. Is it because of carelessness or because people are paying attention so more leaks get counted? Read about it here. Shell’s Frontier Discoverer oil rig is stalled in Subic Bay since it’s become apparent that contingency spill plans approved by MMS really make no one accountable for a catastrophic Arctic marine spill. As Yoda would say, “I sense a hesitation in the force.” BP has also lost out on oil exploration prospects in Baffin Bay off Greenland. Interesting dynamics – that is except for the one metric that really counts today – gasoline demand is rising steadily. This is merely a quick human account of a last-minute leap into a major Federal hearing event. The news, the spin, you will read that in the Post or NYT, or not. When I say “I ask” I mean I ask myself. It was a mild hearing with none of the fireworks you might expect, despite three former MMS managers empaneled. 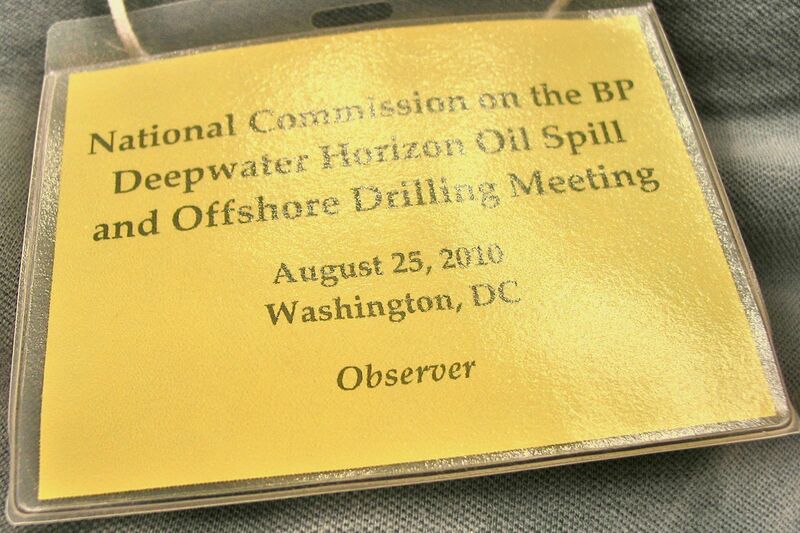 MMS was responsible for the regulation (or lack of it) that fostered a careless industrial disaster that killed eleven men and let 4.5 million + gallons of crude oil to sicken the biosystem of the Gulf of Mexico, the BP Deep Water Horizon oil rig blowout. ATLANTIS, another BP rig even further offshore needs to come under stricter regulation – these hearings are part of the process of developing better rules for the strict regulation of extremely hazardous and difficult deep underwater oil wells such as ATLANTIS. Food and Water Watch organized a demonstration at the site and the link above leads to photos of that. So I waded in just before 11 a.m., making my way through the Renewable Energy exhibits in the forum and signing in as an observer. Blogging from Ronald Reagan Building, Washington DC. 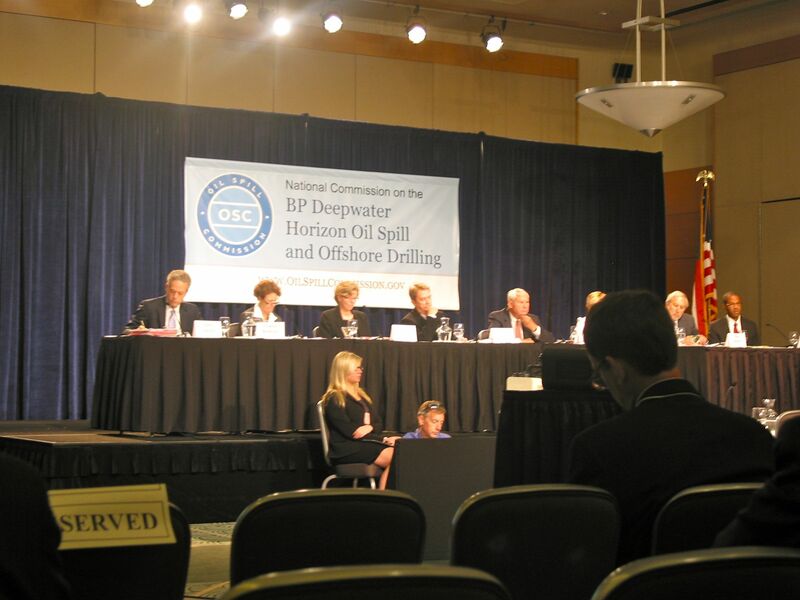 Hearing of National Commission on the Deepwater Horizon oil Spill and Offshore Drilling. 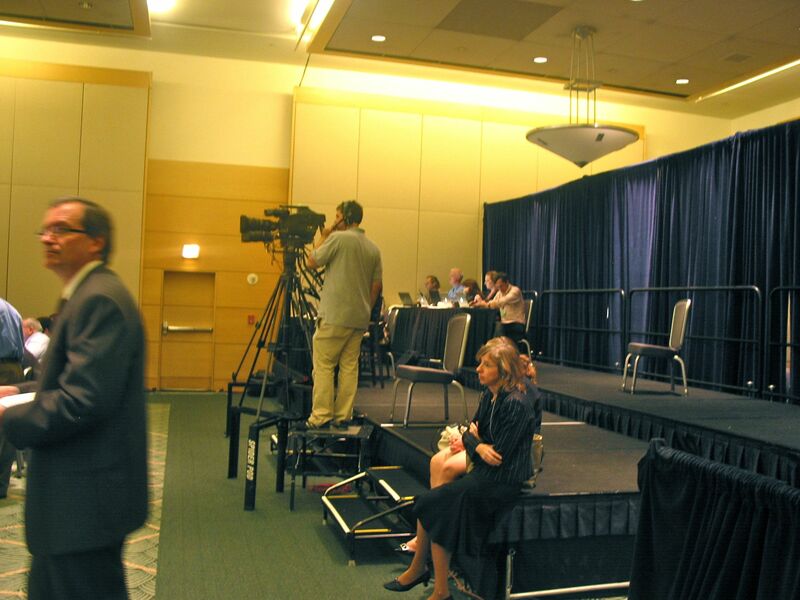 I arrive during Panel 2 : Existing Regulatory Structure and Consulting Agency Roles 10:45-11:10 a.m. while the press were still filtering in and finding a good seat was easy. The front half of the nice hall is filling with suits. 1. feeble regulation is complacent, unfocused, an old boy network? she says that as a result in general real thought is not given to regulation and that the whole affair [BP Oil Blowout Debacle] is an instance of “misunderestimating” the potential quantity and damages rendered of a spill. So, I must ask—what is appropriate underestimating? 11:37 two protesters jump up with banner behind Lubchenco in video camera field – they are advised to leave and are helped to do so. Where they people from our demonstration earlier? It’s unclear. Security staff alert now. In my jeans I earn a few scans. I ask: Who decides what is “fed” to the decision makers? — so they can decide. Is this a process of providing cover for their asses? Or in this realm of spin, pr, and politics, the feed is under a controlling agenda? An anesthetic, administered by PA system via 12 speakers. 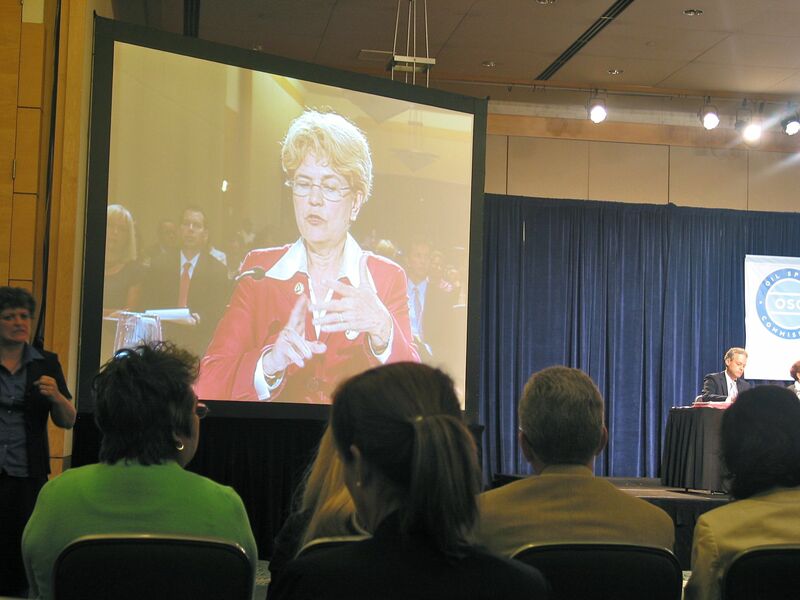 Lubchenco: “still concerned about disbursed oil”, at least (and here SOME acknowledgment that more than 25% of the oil is likely still out there in the gulf someplace) — she says that ¼ of 4.9 million gallons is missing, officially. 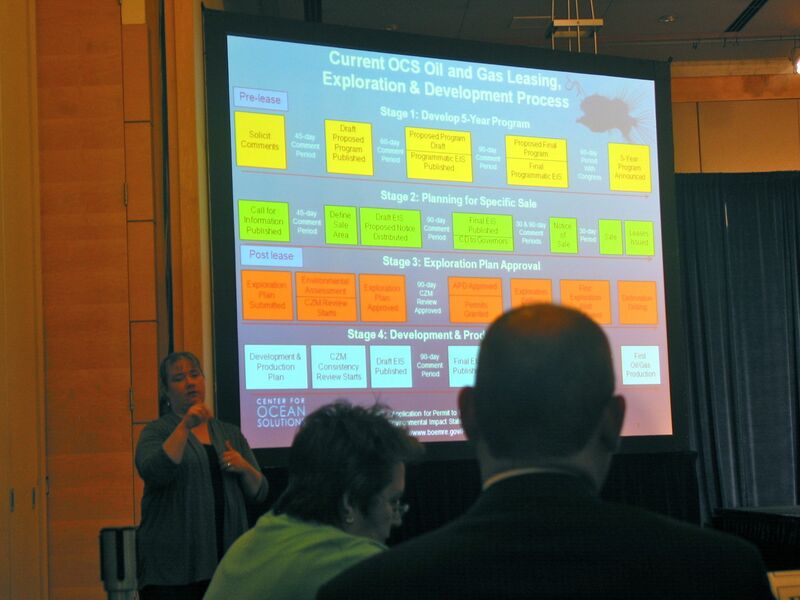 Yet she paints a rosy picture – evaporation, recovery/burning, bacteria and, “we believe” bacteria will not deplete ALL the dissolved ocean oxygen thus creating a dead zone. A bigger one. he seems frightened, providing hiding places in prepared remarks that sounds like a boiler plate talk at small town CofC meeting. Kuthio Looks like Gene Wilder!!!! – I would not trust this guy with my welfare or health. Birnbaum: 5 out of 8 commissioners are a) absorbed in texting?, b) carrying knives to plunge into Birnbaum’s back?, c) sleeping?, d) refusing to look into her eyes?, e) taking notes so they can justify asking questions bordering on the juicy? Birmbaum is happy-happy – she was in charge when MMS were partying down with oil and mining company execs. Lots of tip-toing here, no refs to the nasty part. This environment that leads people to assure when they are not sure is why management is enjoying less and less respect in comparison to “tech” and “data-driven” analysis that makes more sense in a data-rich world. More accessible granular information technology and sensors/metrics will take over the world of management – watch out for what you pray for – you might get it! Sometimes our human administrations are likable, warts and all. 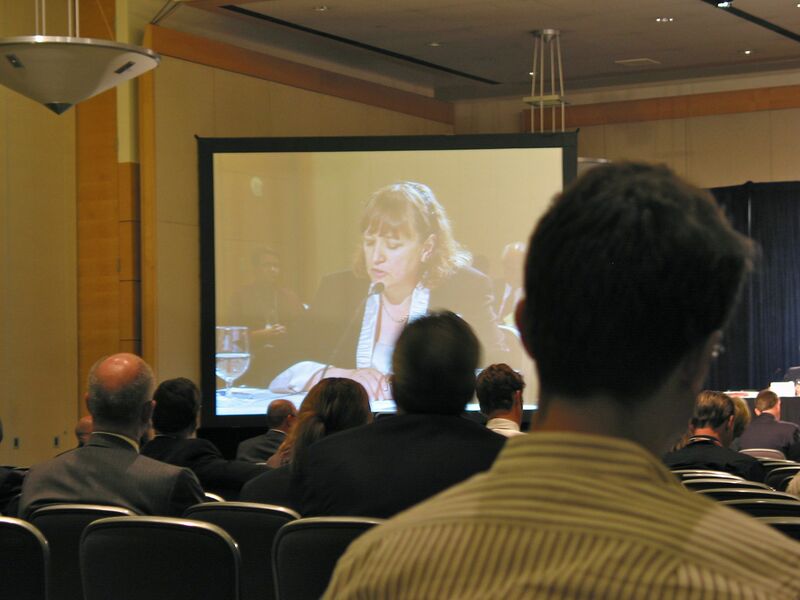 Senator Graham had lots of mild questions – all Commissioners watching now like pirañas – but no one attacks Birnbaum. Odd, if you ask me. This entry was posted in Petroleum Planet and tagged DC Metro, downtown, Glenn Beck, Martin Luther King, Palin, racist, Smithsonian, Stuxnet, Washington DC, Washington Monument. Bookmark the permalink.